Essential Wipes are a small miracle in a compressed bamboo tablet infused with organic therapeutic essential oils. 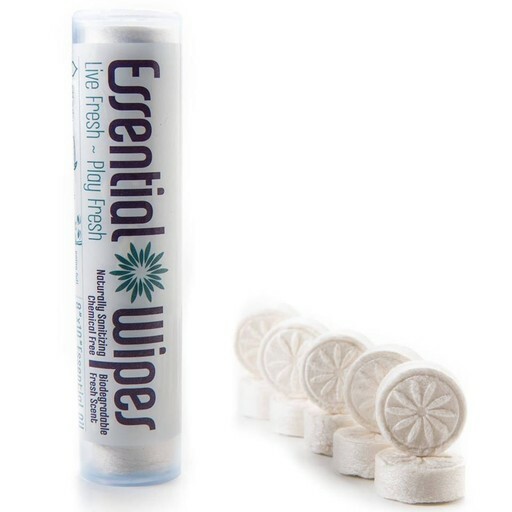 Add less than an ounce of water and they turn into an aromatic, cleansing, travel towelette. Compact and light, Essential Wipes are all natural, with no alcohol or preservatives, and are completely biodegradable, giving a pure and wholesome experience. Great for travel and feeling fresh any where! Put in purse, first aid kit, back pack or in the car. This special essential oil formula is cleansing and nourishing to the skin. Naturally antibacterial, safe for the whole body. Free of harsh chemicals and alcohol. Keep these in my pack at all times. Use them the most camping or at festivals. Non irritating, smell soooo lovely and feel refreshed after!